As several school officials along the Gulf Coast determine whether their districts can start classes next Tuesday, superintendents across the state are encouraging families displaced by Hurricane Harvey to enroll in their schools. When Hurricane Harvey swept across the Texas coast, it decimated Port Aransas ISD’s buildings, forcing the district to close indefinitely — and immediately leaving more than 450 students without a place to attend school. Just 20 miles away on the mainland, Flour Bluff ISD is preparing this week to enroll every one of those students next Tuesday, if necessary. Across the state, as school district officials along Texas' Gulf Coast determine whether they can open their schools on Tuesday as expected, their neighbors are sending the message that they will accept displaced students with open arms, no matter what it takes. “Whenever they decide, when they get back to the area, our doors will be open. We will take kids at any time,” said Kim Sneed, Flour Bluff ISD spokeswoman. And the state is giving evacuated students a “reasonable period of time” to decide where they want to enroll, without subjecting them to truancy laws. “In terms of a parent making a decision, that’s going to be based on a personal need and a personal situation,” Texas Education Agency spokeswoman DeEtta Culbertson said. If parents know they will be in another region of the state for a few months, they should probably enroll their students there, she said. They can also look into homeschooling or virtual schooling options. Federal law requires school districts to take in students displaced by a disaster and provide them with free meals. A student who decides to stay in their original school district must be provided with transportation. A student who decides to attend another school district is not federally required to be provided with transportation. School districts can use federal Title I funds to pay for supplies, materials, uniforms, vaccinations and medical services for those students, if they don't have other funding available. Some Port Aransas parents have already reached out to Flour Bluff ISD officials to say that they have relocated to another part of the state and will enroll there instead. Sneed said officials will need to determine whether they need to invest in more school buses or teachers, once they know how many kids will register. Some school districts set to open Tuesday still don’t know whether that is a realistic goal. Houston ISD, the most populous school district affected by the storm, decided Thursday to delay its first day of classes from Tuesday to Sept. 11, following an assessment of the damage. 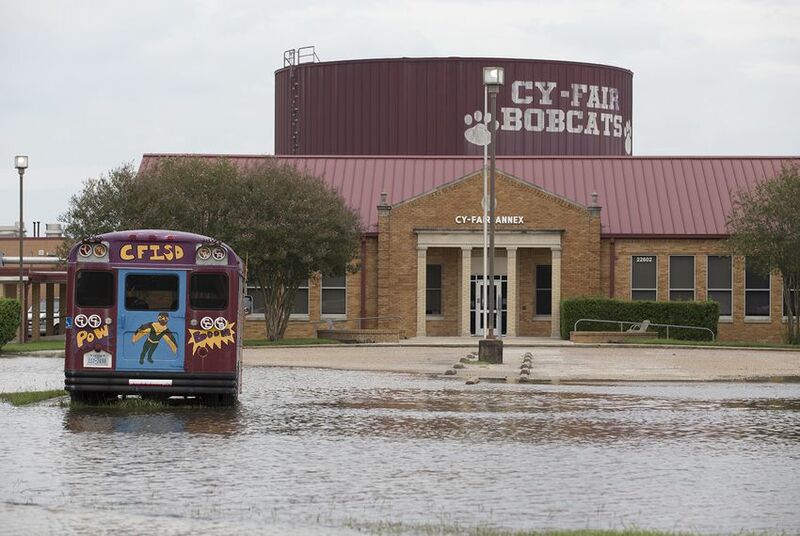 The Houston Chronicle reported that more than 35 campuses have been damaged in the storm, and that Superintendent Richard Carranza told principals seven campuses will need to find a different space or start even later. At Klein ISD, north of Houston, all but one elementary school are structurally sound and ready to open. But, officials don't know whether they have enough bus drivers still in the Houston area to get students to school next Tuesday, Superintendent Bret Champion said. "We're checking with staff to see where we are ... we're hoping those numbers come back pretty strong," he said. Champion encouraged parents to check the district's official Facebook and Twitter pages on Friday to see when doors will open. District officials regularly communicate by phone with their parents, he said. Superintendents at larger districts in the state that were untouched by the storm are encouraging parents who can't get home just yet to enroll students in schools near where they are taking shelter. During the enrollment process, officials are taking students’ names, dates of birth and student identification numbers. The identification numbers allow them to discern which specific services students received in their home districts and provide them in their new districts. "Schools are open across our city to enroll their kids," Austin ISD Superintendent Paul Cruz said Thursday at a news conference. He said district officials are in the process of enrolling fewer than 100 students in temporary shelters across the city. But that number is expected to rise over the next several days as more families are evacuated from the Houston region and have a better sense of the extent of the damage. In San Antonio ISD, a task force is preparing for large numbers of displaced students by figuring out which schools have enough capacity and materials to serve them, said Leslie Price, a district spokeswoman. “We don’t know how many are out there,” she said. Right now, they are working to enroll students who voluntarily evacuated early and are staying with friends and family in San Antonio. Dallas ISD is a little further ahead. This week, officials identified three schools with enough space to enroll displaced students, according to Miguel Solis, a board trustee. “There’s no word or even a good estimate on how many to prepare for,” he said. Correction: An earlier version of this story incorrectly described federal requirements for providing displaced students with transportation.